Well, that niggle was probably the sensation of my placenta clinging on to the muscular layer of my uterus for dear life, as - unbeknownst to me up until the moment it became apparent my placenta was going nowhere following the relatively straightforward birth of my son Elliott - I had a pretty bad case of placenta accreta. I had no knowledge of this medical term until many weeks after the birth when one of the local supervisor of midwives paid a visit to our home to talk to my husband and I about what happened to me - a service Lewisham and Greenwich Trust offers mums who've had a particularly tough time of it to help them come to terms with their experience. I knew my placenta had got stuck, and I knew that I'd lost a very large volume of blood, to the extent that I needed a transfusion, but I hadn't been aware of what caused all of this nasty stuff to occur. When you get pregnant, the placenta normally attaches itself to the outer layer of the uterine wall. With placenta accreta, the placenta attaches itself a little too deeply, into the muscle. This means that the placenta cannot naturally separate and requires intervention to remove it. About 1 in 500 pregnant women encounter it, and it's becoming increasingly common in line with the rise in the number of caesarian deliveries. This is because placenta accreta occurs most often in women who've previously had a caesarian section because the scar tissue left behind is fertile ground for the condition. This also means that women who have had other types of uterine surgery, for example to remove fibroids, may also be at a higher risk. I, however, have never had any kind of procedure in that region, so I was particularly unlucky. What's the difference between placenta accreta and a retained placenta? Placenta accreta is one kind of retained placenta, albeit a rare one. More commonly, a retained placenta is when some or all of the placenta is left floating around inside the womb, and eventually it'll have nowhere to go but out (and may be accompanied by bleeding). With placenta accreta, it is impossible for the placenta to come away without some kind of intervention. Is there any way to tell if I have placenta accreta once I'm pregnant? There are a couple of scans available on the NHS which may be able to detect it (colour Doppler ultrasonography and MRI scanning, both of which have an accuracy rate of around 80%). However, not all UK hospitals have the relevant equipment to offer these, and in all likelihood you’d only be offered one if you’ve had placenta accreta in the past, or if you have a low-lying anterior placenta combined with a previous lower segment caesarian section (LSCS), as this would put you particularly at risk. Should I have the injection to speed up the placenta delivery if I'm worried about my placenta getting stuck? This is 100% a personal decision. Many women prefer to deliver the placenta physiologically (in other words, with no injection) to experience a totally natural childbirth. Fair play to them. I personally wanted the whole thing to be over and done with as quickly as possible, so opted for a managed afterbirth (the injection). I was informed by my consultant that, in hindsight, this was the right decision for me as otherwise it would have taken much longer for them to realise that there was a problem. In my case, because the placenta had partially detached, effectively leaving an open wound inside of me, I experienced very heavy blood loss (four litres in total, which is not unusual for the condition). Obviously major blood loss is extremely serious, but with the right medical care that we're fortunate enough to have access to in the UK, for free, this can be dealt with. What if I don't want a blood transfusion? Again, totally a personal decision. But if I had declined a blood transfusion I'm pretty sure I would have died. More information on blood transfusions is available here. It's worth noting that once you have a blood transfusion, you are not (currently) allowed to donate blood ever again. This is to reduce the (very small) risk of transmitting vCJD (more here). It’s worth noting that some hospitals offer a 'cell salvage' service to clean and recycle your own blood if a placenta accreta is suspected or diagnosed before delivery, or if a caesarean section is planned. Can I stop placenta accreta from occurring again? If only. The supervisor of midwives informed me that, if you've experienced placenta accreta in the past, medical studies have shown that you have a 6% chance of it happening again. This doesn't sound like much, but it medical terms that's apparently quite high, especially when you compare it to the 1 in 500 (0.2%) risk to the general pregnant population. Needless to say that anyone who's had placenta accreta before will automatically be classified as "high risk" in subsequent pregnancies. If I’ve had placenta accreta in the past, I presume a planned a caesarian section would just be safer next time? This is what I thought, but apparently not. After all, a c-section is a major operation, and heavy blood loss sustained whilst you are cut open for the procedure could prove to be more serious. WHAT DOES IT FEEL LIKE TO HAVE PLACENTA ACCRETA? It probably makes sense to break this down into sections, as you're likely to feel lots of things, physically and emotionally. Imagine you've run a marathon, and just after you cross the finish line you get run over by a lorry. That's basically how it feels. You've gone through the most physically demanding and painful hours of your life, and just when you think it's over and you finally get to see and hold your baby, your sense of euphoria is knocked out of you and there are numerous people quite literally rummaging inside your body (with, in my case, having had no pain relief beyond gas and air) in an attempt to pull something out of you. It's horrendous, there's no denying it. I gave birth in a birth centre which is attached to a fantastic hospital with state-of-the-art emergency care, so I was able to receive the help I required relatively quickly. If this does happen away from such facilities, however, the midwife with you will know what to do in order to get you access to the care you need as quickly as possible. I remember being prepped for surgery, having to sign a consent form giving permission for the surgeon to perform a hysterectomy if necessary (a hysterectomy is the simplest way to treat the condition, though for obvious reasons they try and avoid this if they can). I thankfully didn't see the blood, mainly because my eyes were closed for most of it, but I do recall the sound of them suctioning it, presumably so they could accurately measure my blood loss. I can't remember the pain, but I do remember being desperate for the the anaesthetic to take effect so it would all be over. I was scared for my life, and I must admit that - when they allowed my husband in the room just before I went under - I did truly wonder whether we'd ever see each other again. - Relief - I was alive. - Intense thirst - I'd been intubated so my throat was very scratchy, and my body was also working on overdrive to replenish the blood it had lost. - Delirium - I was on 100% oxygen via a mask, later a nose tube. - Hunger - I hadn't eaten anything for almost 24 hours Goddamit! - Fear - I was terrified of haemorrhaging again, so decided the best way of dealing with this was to talk nonsense nonstop for 12 hours to stop me from thinking about what had happened, and what could happen again. - Pins and needles - my hands and arms were tingling for the entire night afterwards, I think potentially related to the anaesthetic. - Exhaustion - once the adrenalin had worn off. - Extremely hormonal - I kept waking up wailing, though I expect this is common for any new mum, with the key difference that my baby wasn't with me. Where is your baby in all of this? It sounds odd, but - once I'd been told he was perfectly healthy - my baby was the thing I was the least worried about. I was lucky in that my parents were on hand to step in while my husband stayed by my side (needless to say a High Dependency Unit is not set-up for babies to take up residency, although he was allowed on the ward for sporadic visits), and they did bloody brilliantly in what must have been awful circumstances for them as well. 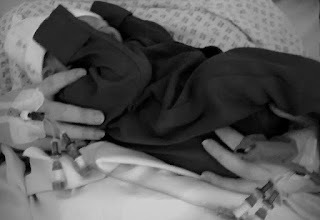 They were given a private room in one of the maternity wards and cared for Elliott for the first two nights, while I focused on getting myself better so I could care for my baby as quickly as possible. So did you ever get the chance to bond with your new baby? This is what I emotionally struggled with the most. Antenatally, so much emphasis had been placed on bonding via skin-to-skin contact in the initial hours that I felt that I had failed as a mother from the outset and I would never be able to make up for it. I had looked forward to giving birth so much and had presumed I would fall head over heels in love with my baby in the birth centre, so when I was whisked away from him it caught me totally off guard. It took me quite a while to come to terms with this and to realise that a very large number of new mothers feel the same, and - if you are separated in the beginning - skin-to-skin contact at any point in those early days and weeks does exactly the same job. Switching the internet off my phone when I finally did get home from hospital and spending a good 48 hours drinking in every glorious millimetre of my new baby also helped. What is a High Dependency Unit (HDU) like? HDU is the next level down from intensive care. Patients in HDU need round-the-clock monitoring and care, but they are conscious and can breathe unassisted. There are two patients for every nurse, and the nurses are there for you 24/7, and throughout the day a host of doctors, consultants and physiotherapists do their rounds. The care I received in HDU was incredible. I was more or less immobile for the first 36 hours or so, and had to be helped to even shift my weight on the bed. I was catheterised, had to be wheeled to the shower on a commode and helped with every bodily function imaginable. It would have been easy for me to have found all of this humiliating, but I was so thankful to be alive - and everyone was so sensitive and caring - that my overriding feeling during my three night stay on the ward was awe and gratitude. What's going on 'down below'? A lot. Firstly, it's all extremely swollen and tender. You may also be the proud owner of stitches if you suffered from any kind of perineal tear (second degree for me). I had a Bakri balloon inserted to stem the bleeding and help my womb to contract down to normal size. The balloon was gradually deflated over the course of a day before being removed (along with, in my case, about a mile of surgical wadding). I was terrified this extraction would be accompanied by blood loss but it was fine, if a little disconcerting. Speaking of which, bleeding after a vaginal delivery is perfectly normal, and the bleeding I experienced was no heavier than average and only lasted a couple of weeks, though I was constantly paranoid I would suddenly start haemorrhaging again. Finally, in all likelihood you'll have a catheter in. This ensures that your bladder doesn't get too full so your womb can contract and prevents further bleeding. It's also extremely handy in light of the fact that you'll be unlikely to be able to get out of bed for 24 hours or so. My catheter was removed just before I left HDU, and it was completely painless. Where did you go after HDU? I spent the remainder of my time in hospital on a maternity ward in a private room. The rooms had a chair in the corner which meant my husband could stay with me and our baby. There is no way I could have cared for Elliott without him. I required regular observing and medication, which often meant we were woken up in the middle of the night (or day) by a midwife / healthcare assistant / consultant coming in to the room - frustrating, but necessary, of-course. We encountered many wonderful people on the maternity ward, and lots of useful advice, but when the only place in the world you want to be is home it's very easy to feel an overriding sense of resentment that you're cooped up inside at the behest of someone else's timetable rather than enjoying the early days with your baby on your own terms. I've written separately about that here. But, in short, if you want to, it can be done. But it will require time, patience and a lot of support, which the hospital should be set-up to provide. Ask for help if it's not forthcoming, and don't beat yourself up if you turn to formula in the early days - I couldn't have established breastfeeding without it (and we still happily use it months down the line). How long do you have to stay in hospital for? I can only speak from my experience, but I was in hospital for eight nights. The team caring for me wanted to ensure there was no placenta left inside before discharging me, which required my womb to have sufficiently contracted down before performing an ultrasound scan. This scan was probably the most petrified I felt throughout the entire experience. It was almost a week since the birth when I had it, and I'd made so much physical progress in terms of being able to get out of bed and move around a bit. I feared that if I needed to go through the entire ordeal all over again I'd be back at square one. The scan did indeed reveal that there was still a blob of placenta left inside, and although in some cases this can be left alone to be absorbed, it was recommended that I had an additional operation under general anaesthetic to remove it. Fear not, though, if you do need this second procedure it's a completely different kettle of fish to the initial operation. It's a routine procedure as opposed to an emergency, so you won't wake up feeling as if you've just been in a massive accident. In fact, I felt brilliant (albeit still physically frail) the following day as a huge weight had been lifted off my mind, since I finally knew that all of my pesky placenta was gone and there was no longer a risk of haemorrhaging once I returned home. You must have been thrilled to go home finally? You'd think. But despite feeling on top of the world the day before we went home, the next day was a different story entirely. Remember how you've run a marathon and then got knocked over on the finish line? Well, now imagine that you finally know that you're going to get through this, albeit with a long period of recovery ahead of you, but then someone hands you a screaming, hungry newborn baby, and it's partly up to you to keep that baby alive. All your body wants to do is sleep and recuperate, but you can't. And the realisation of this momentous responsibility suddenly dawned on me the day I was due to go home. I was a complete mess. I was physically and mentally exhausted and felt utterly hollow and bereft. I was also suffering from flashbacks of everything that had happened over the previous week and - when sleep finally did come - it was blighted by disturbing nightmares. I can honestly say that I've never felt less 'alive' than I did the day I got home with our new baby, which breaks my heart to this day. How long did it take for you to feel 'normal' again? With the exception of a few blips, I felt slightly better every day. I can't emphasise how important sleep was - an hour here, a couple of hours there - every time I woke up having banked a bit more slumber I felt a little stronger, and I could feel my personality and sense of humour rising up from somewhere deep inside. I spent the first 24 hours or so in bed, then the next day I'd venture downstairs to lie on the sofa, the next I'd sit on a dining room chair (with the help of a donut cushion), followed by stepping into the garden, walking the pram to the end of the road and so on and so forth. I was on a lot of medication to begin with (painkillers, antibiotics, iron, laxative), but within a week or so of returning home my iron levels were back to normal and we worked out a little system for both of us to get (just about) enough sleep to make it through the next 24 hours. After a couple of weeks we started to welcome visitors beyond immediate family, and my husband returned to work. I felt 100% better - physically and mentally - within about eight weeks. However, EVERYONE IS DIFFERENT. - Immediate family - for the first two weeks we had immediate family on hand to take care of us, while we looked after Elliott. Let them cook, do the washing, get supplies from the shops - anything that needs doing beyond caring for your baby. If they offer to have responsibility for the baby for a night or two, even if it’s just in the next room, take it, and bank as much sleep as you can. - Find women with similar experiences - I was put in touch with numerous women (via friends and a local Facebook group) who had encountered similar experiences when I posted an appeal for help. Their messages while I was still in hospital provided me with much-needed slices of hope that things would improve and - one day - I would feel like myself again. - The NCT - I also called the NCT helpline and was referred to a lovely lady who had gone through a similar birth experience. We spoke (well, she spoke eloquently while I mumbled) on the phone one evening for around an hour and she gave me some fabulous tips for conserving energy once my husband returned to work. Hearing her children happily playing in the background whilst I was curled up in bed in a dark room was also strangely soothing. The NCT also offer breastfeeding counselling over the phone. - Birth Trauma Association - I only learned about the BTA many weeks after I returned home, by which point I felt much stronger and in control - but they can also refer you to women who have experienced a similar birth. - Supervisor of midwives - as previously mentioned, all Trusts have a supervisor of midwives team who are responsible for protecting women and their babies through ensuring midwifery standards are as high as they can be. Although they work closely with the midwives who provide the care, they report to a separate body and are therefore impartial to ensure they have the mother's best interests at heart. If you have any concerns or questions about the care you have received, ask to be referred to your local supervisory team. - Healthcare professionals - if you continue to struggle emotionally following the birth, I'd advise you speak to your GP or health visitor for further advice. It is possible to suffer from post traumatic stress disorder (PTSD) after a difficult birth, and they will be able to refer you to sources of additional help. But, hey, you got your baby at the end of it all, so all worth it, right? Well, yes, of-course! Regardless of how tough a time a mother has when they give birth, the vast majority of attention naturally shifts to the baby once they arrive, and while your bundle of joy gives you a motivation like no other to get better, don’t underestimate - or let anyone else underestimate - what you went through to bring them into this world. Give yourself a break, ask for help (and, crucially, accept help when it's offered) and happy times will arrive sooner than you think. If you have any other additional questions about placenta accreta, or want to contact me about any element of this post, please feel free to do so. I would never want to go through it again, and of-course I wish things had been easier for us, but I can honestly say that I have never felt more thankful to be alive as a result of my experience, and so in awe of the NHS and the people in the world who I love the most. Many thanks to the Lewisham and Greenwich Trust Supervisor of Midwives team for fact-checking this blog post. Im now going to bookmark it and come back to it later when my girls are at their nans as here will be many tears flowing. I wrote a quick blog post on my blog last week but I havnt been able to go into it all in detail. I am requesting my medical notes from the hospital so I can fully read my own case. Im a lot more 'clingy' with the boy than I was with either of the girls because of it. I also had never had a c-section or any kind of surgery so was another unlucky unexpected one. My son was born at home with just paramedics at hand to catch him, the maternity unit ignored the fact when I first rang them I told them how fast my daughters labour was and they told me to stay at home. Every night I feel them putting the mask over my face, pushing on my collarbone area, voices speaking which I dont understand, machines beeping away.. my boy will be 4 weeks old tomorrow.